Peterborough have sacked Josh Yorwerth after confirming the defender has been given a four-year ban for evading an anti-doping test and taking cocaine. The 23-year-old, who has not played since September, was charged by the Football Association in December. Former Wales Under-21 international Yorwerth joined the League One club on a three-year deal from Crawley in July. "The football club wishes to confirm that his contract will be terminated," said a statement. "The football club wishes Josh well with his recovery and for his future and hope he continues to get the support he needs from those in a position to help." Ex-Ipswich centre-back Yorwerth made three appearances for Posh this season, having signed for an undisclosed fee. His initial FA charge alleged he had "evaded sample collection or, without compelling justification, refused or failed to submit to sample collection following notification by an anti-doping official". 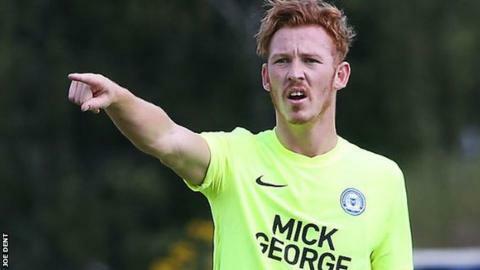 Peterborough added that they - alongside the Professional Footballers' Association - had been working with Yorwerth to help him overcome "a number of personal issues". The FA are yet to reveal the outcome of their disciplinary procedure against Yorwerth and a spokesperson told BBC Sport: "This is an ongoing case so it would not be appropriate for us to comment further at this time."